People prone to tension headaches are often prone to the effects of stress as well as depression and anxiety. A major effect of these factors is muscle tension in the neck and shoulders that have attachments on and around the skull. Stress and anxiety contribute to reductions in pain thresholds, making it more likely that a headache will occur in situations others might consider normal. Poor/uncomfortable work posture and/or sustained reading in association with bright lights. Work stations, even when set up correctly, can cause headaches. 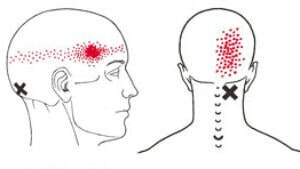 The issue most relevant to headaches in these cases is monitor position. It should be at least 60cm away from you and slightly below eye level. Eyesight can deteriorate without your knowing and is increasingly common as aging people use computers. Even if you have prescription glasses, it may be time to get reassessed. Be aware that wearing bifocals demands titling of the head backwards and can contract the neck muscles that attach to the back of the skull. Hunger causes muscles in the neck to tighten and can trigger a headache. Missing or delaying meals also causes a drop in blood sugar levels that leads to the body releasing hormones to counter low glucose levels, which also trigger headaches. the head and neck. If you experience frequent tension headaches, keep a diary to try to identify what may causing them. Have your eyes checked regularly, even if you wear glasses. Aim for between seven and eight hours of sleep per night.